There's just one building on the entire beach, nestling under a moonscape of wind-shaped volcanic cliffs. The cafe, built around an old caravan was virtually customer-free so we stopped off for a tea and watched the waves come crashing in. 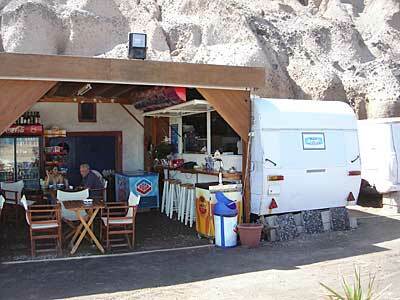 Strangely enough, the cafe claims to be in Exogialos Firon, some 1,000 metres north. Weird!